iLife ’06 was released at the January 2006 MacWorld conference and took up much of the Keynote speech. Some were a little miffed about this but personally I enjoyed the release because iLife ’06 is a fantastic package. Before the release there were rumours that a web editing application would be added to iLife after someone got wind of a patent application for the name "iWeb". The rumours proved true. First of all iWeb is not a replacement for DreamWeaver, GoLive, or even Rapid Weaver but is instead an application that brings the whole of iLife together for the Net. As this is the first review of any of the iLife ’06 components, let’s take a moment to talk about the software packaging. Apple have finally realised you don’t need a big box for a small product. iLife ’06 introduces us to a disc-sized (or CD sized if you want) box that contains an install DVD, a trial install DVD for iWork ’06 (Pages 2 and Keynote 3) and a small 6 sided (3 page) brochure about iLife itself. 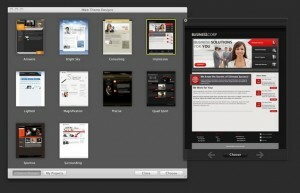 iLife ’06 comprises a number of products – iPhoto 6, GarageBand 3, iMovie HD 6, iDVD 6 and of course, iWeb (version 1). Installation is straight forward – A launch of the installer from the DVD and then about a 20-30 minute process (remember, there are a large files for themes etc.). I’ve used many editors and have tried a number of graphical editors including FrontPage (cough splutter hack wheeze). I’ve never liked graphical editors on account of messy code, bloated code, and in cases like FrontPage (surprise, surprise), non-standard code. A test using the W3C XHTML validator shows that in all bar one page, the code is 100% compliant which is amazing for a graphical editor. iWeb is so dead easy to use I had my site content moved from XOOPS running the WordPress module to a site built using iWeb in roughly 2 hours. And not only that but done with a nicer layout and easier importing of graphics into the layout. How easy is it to create a page in iWeb with graphics? If you’ve used iMovie 5 you’ll understand what I’m getting at here. Say I want a photo that’s in my iPhoto archive. I click the Media button then click the Photos button. 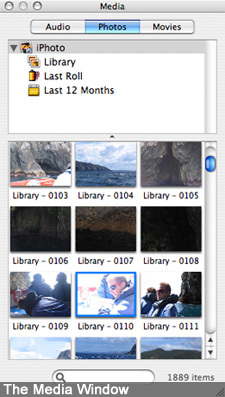 Find the photo you want then drag it into the area of the page you want it to be placed. Done. No seriously that’s it. Found a cool photo on the Net that you want to use? You drag an image from Safari directly onto iWeb and use that. Dead easy. Blogging and podcasting have taken off over the last couple of years and iWeb caters for this also. Once again it is so easy to do. Open a new page and you’re met with the templates screen, where you can choose a design layout (theme) that matches your initial page (or not, if you want) then choose the Blog page. You’ll notice on the left that there is a dropdown menu beside the page and there are two options under it called Entries and Archives. Entries is where you create the blog entries for your site. This is similar with the podcast part. 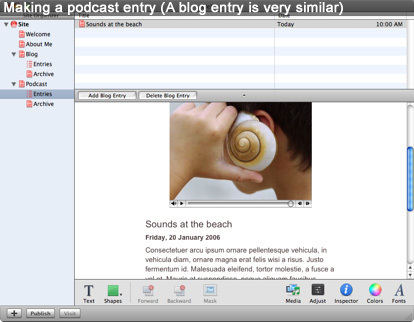 Both are all drag and drop like above…with the podcasts you drag the audio file (MP3 or MP4a) to the picture that is already there and iWeb changes the picture to that of your audio file if you have one. Of course you aren’t just limited to the templates and you can create boxes, links, buttons etc as required. Uploading to site is done in two ways. 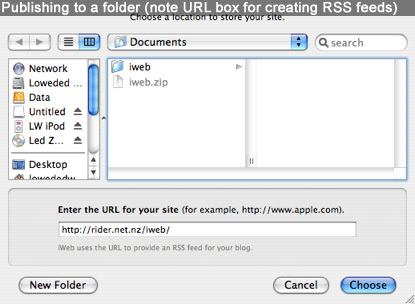 Single click publishing to .Mac accounts or the long way involving publishing to a folder, then FTP-ing these files to a web host/server. With regards to FTP, it would be nice if Apple fixed the FTP mount in Mac OS X so that Publish to Folder could be done merely by choosing the FTP mount on the Desktop. Maybe in Mac OS X 10.5 or even a dot release of Tiger. Maybe not. There are a few issues that I think should be addressed in future versions. Firstly it’s annoying when you load up iWeb and you don’t have a .Mac account because what happens is you are faced with a screen asking you to sign in to .Mac or register. It would be nice to have an option to turn this off but there isn’t one, at least not that I can see. Lastly it would be nice to create a page how you want it then export or save it as a theme so that you don’t have to make manual changes to each page. It would also be nice if when you create a new entry for a blog, it took on the title of the blog instead of always showing "My Blog" and requiring a manual change to match the title of your existing blog, podcast or videocast. For a first time effort iWeb is wonderful. It’s not meant to replace DreamWeaver or GoLive, or even Rapid Weaver, but it is meant to allow the average person to give their voice without learning XML.